ISBN 9781585603220. With Text Language: English. Classical. 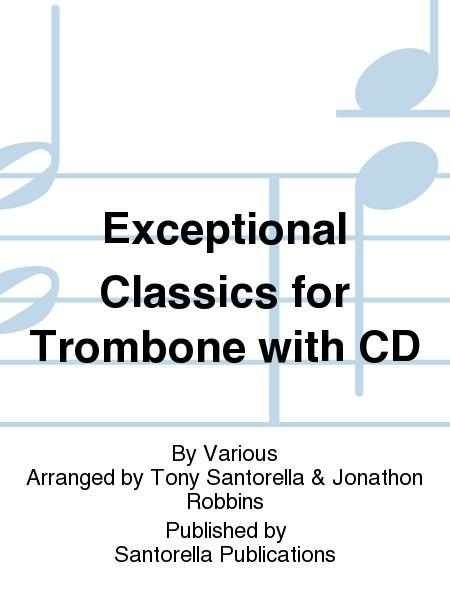 Unlike many collections which feature obscure titles, Exceptional Classics for Trombone, arranged by Tony Santorella and Jonathon Robbins features a broad assortment of well-known classics originally written for piano. This best selling title contains works from a variety of major composers, which by its nature, provides examples of music written from several different eras. This eliminates the need for multiple teaching materials and is a great resource for teaching young horn players early, easy, original classics. Exceptional Classics for Trombone published by Santorella Publications is a required text for many state audition lists and is suggested by music educators associated with the highly regarded NYSSMA organization. The accompanying CD is an acoustic piano accompaniment and extremely helpful towards learning these important masterpiece themes. Little Cradle Song, Schumann - Russian Folk Song, Beethoven - Tell Me, Fair Ladies from "The Marriage of Figaro", Mozart - The Organ Grinder, Tchaikovsky - Allegro, Mozart - Minuet, Bach - Minuet, Haydn - Russian Song, Tchaikovsky - Serenade, Mozart - Gavotte, Bach - German Dances, Haydn - Andante from "The Surprise Symphony" No. 94, Haydn - Waltz, Beethoven - German Dance, Schubert - Ecossaise, Beethoven - Canon In D, Pachelbel - Ode to Joy from " Symphony No. 9", Beethoven - Two Minuets, Bach - Jesu, Joy of Man's Desiring, Bach - Andante, Mozart - Aria, Bach - Serenade from "Eine Kleine Nachtmusik", Mozart - Norse Song, Schumann - Old French Song, Tchaikovsky - Turkish March from "The Ruins of Athens", Beethoven - The Wild Horseman, Schumann - Two Minuets from "The Notebook of Anna Magdalena Bach", Bach.